Kariobangi Sharks’ forward Eric Kapaito described it as a dream come true when he was crowned the Kenyan Premier League player of the year on Thursday evening during the annual league gala ceremony at the Kenya School of Government. The 23-year old playing the top tier for his first season beat last year’s winner Mike Madoya and the Bandari FC duo of Faruk Shikhalo and Felly Mulumba to the award. “This is a dream come true for me because I have been looking forward to this day from when I was young. I feel really privileged especially winning this in my first year in the league and hopefully, this will be a stepping stone to bigger things,” Kapaito told MichezoAfrika. The striker was the biggest winner at the ceremony having also bagged the golden boot and new player of the year awards while he was third in the fair play player award. Kapaito who joined Sharks from FC Talanta took home a whooping Sh1,775,000. The former FC Talanta forward struck 16 goals in 28 matches, four of which were as a substitute. Four of his goals for Sharks were match winning goals which earned the team 12 of the 51 points Sharks gathered this season. Meanwhile, Mathare United youngster Cliff Nyakeya bagged the midfielder of the year award beating Ulinzi Stars’ Elvis Nandwa and Zoo Kericho’s Madoya. Nyakeya played all 34 of Mathare United’s matches this season, amassing 2,978 minutes and scoring 14 goals in the process, two coming off the penalty spot. He contributed 16 points for the Slum Boys with four of his goals being match winners while another four won a point each for the side. “I am really grateful and lost for words. This has been down to hard work and the coaches putting in some good tactics for us to use and giving us a good game plan. I remember when I was at Gor youth I almost gave up on football but my second family, Chris Omondi, took me and mentored me. 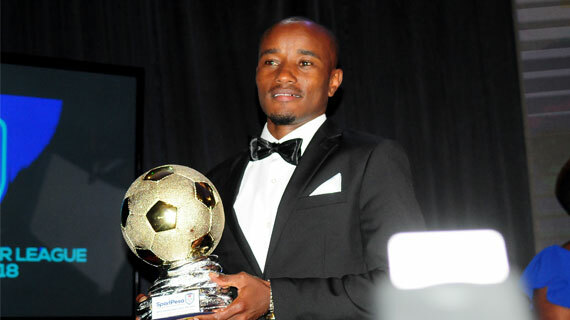 I dedicate this award to him,” Nyakeya stated. The Bandari FC duo of defender Felly Mulumba and Faruk Shikhalo won the defender and keeper of the year awards with the side having had the meanest backline, conceding only 20 goals the entire season. Shikhalo kept 18 clean sheets in 33 matches played while Mulumba played 29 matches for the Mombasa based side, scoring twice, both being match winning goals. Posta’s Titus Achesa was second in the category having played 30 games, scoring twice in the process. However, he was part of a defense line that conceded 37 goals in 34 matches. Ulinzi’s Oliver Rutto was third after playing 28 matches, scoring thrice in the process. In the coaches’ award, Gor’s Dylan Kerr was the undisputed winner having led the side to a record 17th league title, winning the crown with six matches left. Ulinzi’s Dunstan Nyaudo was second having led the soldiers to a fourth-place finish, winning 15 of their 34 games. Sofapaka’s John Baraza who took charge of the side early in the season after the exit of Sam Ssimbwa managed 24 matches, winning 10 of them, a win rate of 41.57pc.